In PwC’s most recent global CEO survey, roughly 75% of respondents ranked Availability of Key Skills as a top concern affecting their organization’s growth prospects. Only Over Regulation and Uncertain Economic Growth ranked higher. The implication is clear: CEOs recognize the crucial reliance on a workforce with the right skills. The need is especially true given the rapid advances in workplace technology and the persistent skills gap for those workers with outdated or underdeveloped skills. This challenge is likely due to a misalignment between what CEOs consider important and what L&D is accustomed to measuring. L&D analytics are often seen as being subjective by the C-suite because they usually include assessments from participants on the training and development program. This data can include 1) how confident employees are in their ability to apply acquired knowledge and skills to their jobs, 2) employees’ perception of the relevance of training received, 3) the effectiveness of training materials and instructor quality, and 4) how conducive training venues are to adult learning. While trainee feedback on instructional materials, instructor quality, and training venues are important, it’s not the most useful set of metrics to the C-suite. 1Know Your Business – Global organizations are extremely complex, and it’s virtually impossible to understand all of a company’s operations. It is possible, however, to be well-versed in the KPIs used by functional, LOB, and regional leaders. While every business is different, it’s safe to assume that these KPIs will be tailored versions of the following key business metrics. Each of these represents an important objective measurement on growth and progress. 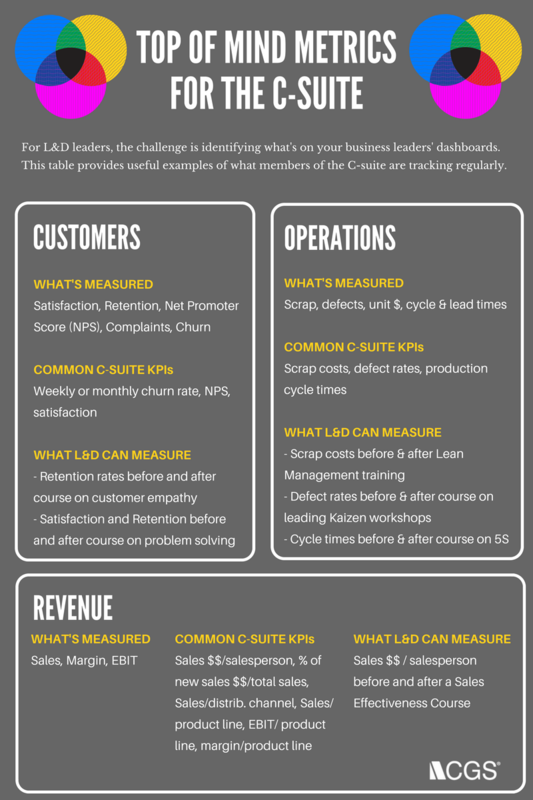 For L&D leaders, the challenge is to find out what your business leaders have on their dashboards. This graphic provides some useful examples of what members of the C-suite track regularly.² Depending on the industry and company, these could be on any CXOs daily, weekly, or monthly dashboard. 2Be Proactive – Learn about your company’s 12-24 month strategic objectives and the potential skills challenges in meeting them. In most companies, strategic objectives are cascaded down and become part of most employees’ development plans. Speak with plant managers, site leaders, call center managers, and managers of shared service centers. In these conversations, you can learn the objectives they need to achieve, and their teams’ skills deficiencies. Similar insights can come from structured conversations with regional sales directors, marketing directors, procurement managers, or compliance directors. What these conversations will also reveal are the special projects in their 12-24-month pipeline, and the skills gaps they’re encountering. A perennial challenge is finding the right people to undertake these strategically important projects. Given the evolving demands of any business, these projects could be with compliance, marketing, sales, operations, or HR. The highest performers are usually overcommitted, but there are other players on the bench who are equally capable. L&D can provide the CGS’s Enterprise Learning Group serves as a trusted partner to many of the world’s most dynamic companies, delivering innovative, custom learning solutions that are essential to scaling their people, processes and performance. CGS’s custom professional development solutions range from interactive game-based eLearning to transformational technology rollouts. Each solution is designed to keep clients’ employee-related business fundamentals strong in today’s ever-changing corporate environment support needed to drive these proactive programs that strengthen and future-proof the business. Helping LOB leaders identify these players on the bench before a pain point bubbles to the surface could be a game changer. Assess what type of support or training L&D can offer to this talent- problem-solving, interpersonal skills, emotional intelligence, creativity, or leadership. 3Measure What’s Important – Consider putting together data collection mechanisms that measure longitudinal performance objectively. Don’t rely too heavily on trainee feedback or qualitative data that is inherently subjective. For example, in rolling out specialized problem-solving training in support of transformation programs, enlist the help of the Finance organization to measure the EBIT impact of projects undertaken by trainees. These are relatively straightforward steps for Learning and Development teams to take on. Using multiple versions of the ABCD approach- Always Be Collecting Data and Always Be Connecting the Dots, L&D will land an undisputed lead role in delivering on the business metrics that matter.